Two years ago I wrote about the worst Christmas present ever. Some of you may have seen it then as part of a Tribal Blogs Blog Carnival. If you didn't, or can't recall it, sit back, relax and enjoy this little reprise. 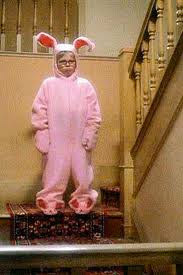 Remember Ralphie in the movie A Christmas Story? His Aunt Clara sent him a bunny costume. Yeah, it sure sucked to be him. Some of you may wonder why I haven't been around to your blogs lately or replied to comments on my posts last week. Well, I took the week off and went fishing. Yep, a week with no internet. No blog, No Facebook. No e-mail. It's taking me a day or two to recover you understand. But I've replied to all your comments and soon I'll be stopping by your blog. And tomorrow I'll tell you all about my little fishing trip. Remember the movie Deliverance? Yeah, it was nothing like that. 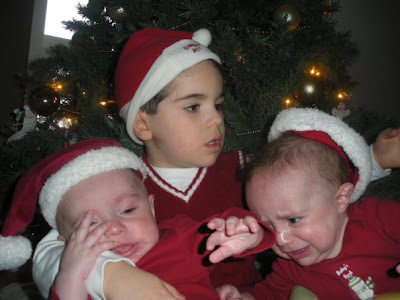 Meantime hit up Nicky's link thingy over at We Work For Cheese and see what everyone else's worst Christmas was like. I used to tell my kids that if they weren't good, Santa would bring them socks and underwear for Christmas. As a joke, my mom stuffed MY stocking with socks and underwear. The kids thought it was hysterical that I was on Santa's naughty list. My mother still wraps socks and underwear up for my brother and he's 54. Well, now I know what to get you for Christmas! Not the main gift, eh? *wink, wink* Say no more. Oh, back then I bought him a lot of clothes for Christmas since he didn't care for shopping. I can't even imagine Christmas in the snow. Actually, I can hardly imagine snow at all. Socks and underwear are still wrapped up as gifts, Dufus. And I still think it's a funny gift! It was for me...to the point I was able to bring my limit home after eating everything else we caught. I hope they're biting for you. Snow's an essential part of a Canadian Christmas. Although at my age the charm has warn a little thin so I've been spending Christmas in Panama the last few years. There a sandy beach holds a whole new charm for me. I guess that would work for a guy who hates shopping. I hate shopping too. Now that would be the worst Christmas EVER! Off the grid for a week? Christmas came early. I loved your Christmas story. It's so true about the dreaded department store box when you're a kid. As soon as you see the tissue paper, you know you were screwed. Well, we actually ran across a few hillbilly characters who looked like they were in that movie like the guy that sold me my fishing license. But he turned out all right. He didn't play the banjo. Oh, you bet. It was amazing not going on a computer for 7 days! Oh I got toys and stuff too. But it's amazing how so many adult family members thought clothes would be an ideal gift. Good to be back and catch up with my webby pals. Socks, or a tie was what we always bought our dad. He always seemed to appreciate them, or was he just pretending? In later years we bought him paints and brushes. He was an artist and painted every day, so would always need those. Men were hard to buy for. Welcome back, Dufus! Socks and undies are the norm for us, too! But we always expect to get them and it's part of the Christmas experience! My kids used to give me ties. The more outlandish the better. I loved them. It wouldn't be Christmas without a 3 pack of briefs! Oh my GOSH! I LOVE THAT PICTURE. First and last, with last being AWESOME! They're older now of course. 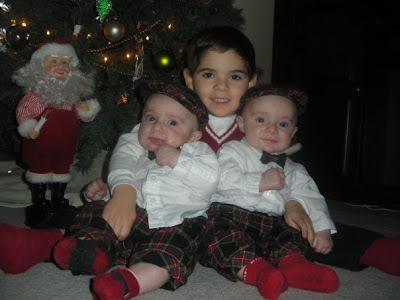 Miko just turned 6 last week and the twins Emery and Noah will be 3 in July. That second picture is just hilarious.